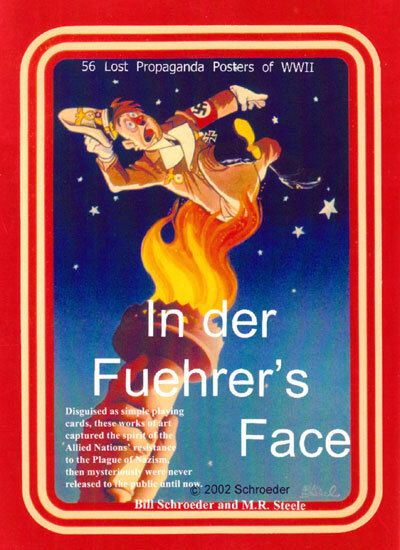 “In der Fuehrer’s Face” playing cards were created between 1943-45 by Antonio Arias Bernal, a Mexican artist and political cartoonist for the U.S. Government as a series of propaganda posters of World War II. They were originally intended to be distributed in Central and South America by the US government as part of a propaganda campaign to bring the South American countries into the war in order to speed up its conclusion. However, the end of WW2 brought diminished interest and funding and the project was shelved before publication. The few copies of the posters lay forgotten in library drawers until the deck was rediscovered and published in 2002 by Bill Schroeder & M.R. Steele. Disguised as simple playing cards, these works of art capture the spirit of the Allied Nations’ resistance to the plague of Nazism. 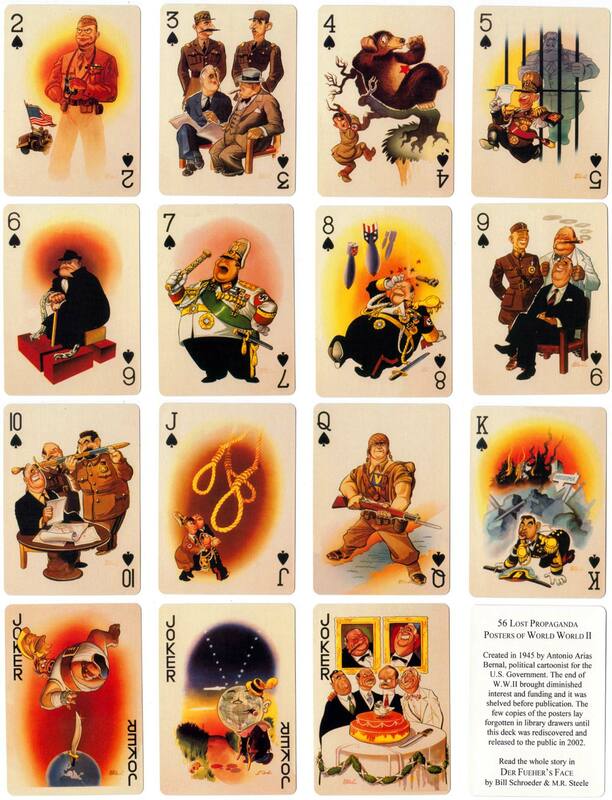 Above: “In der Fuehrer’s Face” playing cards designed in 1943-45 by Antonio Arias Bernal, a Mexican artist. By a twist of fate as soon as he had begun the paintings the war in Europe began to go the way of the Allies. Also around the same time six South American countries declared against the Axis powers so the need for the playing cards was really gone. But as he had been paid already Bernal decided to complete the task which he did by 1945. The cards follow the career of Hitler chronologically beginning with the ace of diamonds, through clubs, hearts and spades to the final King showing Emperor Hirihito crawling away from Hiroshima. However, they were not published until Bill Schroeder rediscovered them and published them in 2003. Bill Schroeder named the pack from the well known song “Der Fuehrer’s Face” by Spike Jones and his City Slickers released in 1942. This was a taunting and disrespectful parody of the Nazi song “Horst Wessel Lied” which included a lot of “raspberry blowing”. Published by Bill Schroeder & M.R. Steele, Banner Publications, Finksburg Maryland USA. Images courtesy Rex Pitts. ← Left: model based on the famous photograph of the “spontaneous” kiss taken by photographer Alfred Eisenstaedt (1898–1995) depicting the joy when it was announced in Times Square, New York, that the Second World War was over.